WINNER WINNER WINNER...I went to random.org and it selected comment #41 as the winner. As long as I counted correctly that makes Golda the winner! Congratulations! Welcome to the CardSwaps Sugar Crash Blog Hop...you should have arrived here from Meredith's blog. She makes some really great things and I love that her son makes cards with her :) If you didn't start at the beginning you should go back to Lora's blog so that you can see all of the work that everyone has done :) You can get to Lora's blog by clicking here . Now for some fun stuff...as a nice way to say thanks for checking and commenting on our blogs you will be entered to win a prize. For my prize I am giving away 3 cling stamps and some ribbon. After you have gone to all of the blogs and left a comment you should hop over to cardmaker's website and check out the crop that we have going on :) You can get to the crop by clicking here There are 10 challenges to be posted over the next 3 days (November 4-6, 2010) and EVERY challenge will have a winner. What’s the prize, you ask? A paper crafts books from CardMaker Magazine!! PLUS, one lucky crop participant will win a card making kit that makes 50 cards!!!! It’s very cool… you MUST play along. I stamped my snowflakes(on the non-shinny side of the tissue paper) using versamark watermark ink and then put whisper "silver tinsel" embossing powder onto the stamped images. 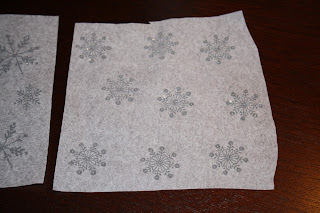 Then I used my heat gun to heat the snowflake images. Next, I cut the snowflakes out of the tissue paper and pasted them onto the candle using a small amount of adhesive. 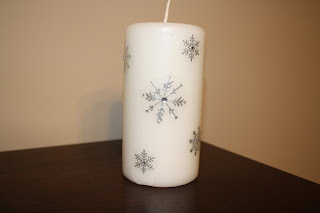 Then I used my heat gun again and heated up the candle where the snowflakes were. The wax melts and the tissue paper sinks into the candle. At my house for Christmas I put a tree in every room including the bathrooms. We always celebrate Christmas eve with my dad and then go to midnight mass. Then we spend Christmas day with my mom and have dinner with my husbands parents and grandma. I love Christmas and can't wait for next year when my husband and I will be able to celebrate with our first child. You have until 11:59PM CST, November 6, 2010, to post your comment on the blogs on the hop (that includes mine, please! Everyone that comments on my blog will be entered in to the drawing for a prize from me. In addition, if you want to participate in the challenges for the Sugar Crash Crop go check it out after the blog hop and upload your completed projects by 11:59PM CST, November 8, 2010. There are prizes to win there, too! What an awesome project Ashley! Oh my gosh, I wish I could do this. I've never owned/used embossing powder or a heat gun but this might just inspire me to do it. Thanks for sharing. Wow, what a super neat gift! I'm totally going to dress up the candles that I have on display now...they are the right color...but so boring! Not anymore! Thanks for the idea! 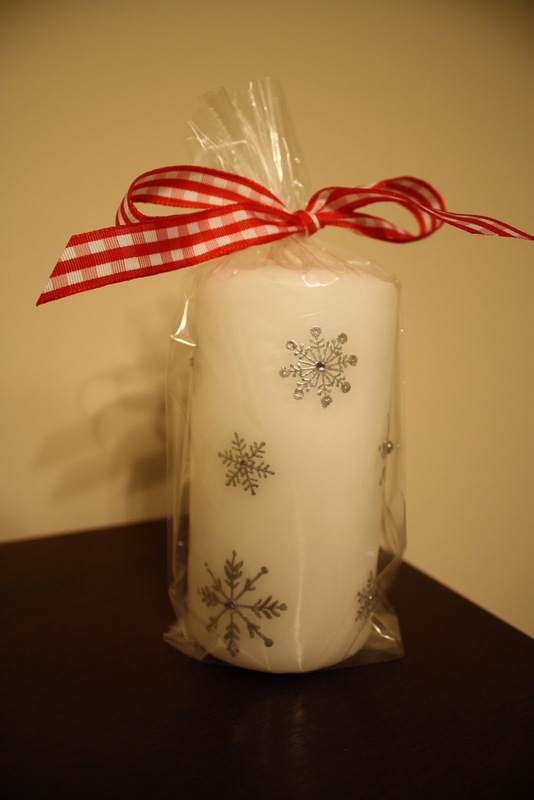 wow this candle looks very cute with those snowflakes. love the gems on them. This is a GREAT project! It looks really fun too! I will have to try this. What a gorgeous last minute gift idea! By the way, I absolutely love the picture of the dog at the top of your blog. So cute! love your project. always wanted to do something like that, but never got around to do so. thnx for sharing! This is a very cool project! Knowing me, I will not only alter the candle - but ill melt it as well, lol!! You did a great job! Wow....gorgeous candle. What a great gift idea! Gorgeous candle. I just love these. Congrats on your new addition?? Sounded that way. We pretty much do the same for the holidays, wait till your doin it with a baby! What an excellent gift idea. Dollar store, here I come! Very pretty. TFS and God Bless. Great tutorial!! I have never done any stamping on tissue paper! This sounds like fun. Thanks so much for sharing the idea with us! I make these every year for my little goody bags. Now I have my daughter helping me with the project. Great ideas! Love your candle! It's such a fun and easy way to dress up a plain candle. Thanks for sharing! What a quick and BEAUTIFUL gift!! TFS! Congrats on the new little one. How exciting!! I have 4 candles that I want to decorate this year. I love the idea of the sparkling snowflakes and I think that is the decoration I will try. And it looks so cute all done up in paper and a bow. I love it that you put up Christmas trees all through the house. Last year was my mother's 90th birthday and because she was born on the 28th of December in Bisbee Arizona, all four of the sisters and mother convened in Bisbee at Christmas time. We stayed in a bed and breakfast and the woman had it decorated with trees in each room. Beautiful! Ooh wow what a nice project. I haven't tried anything like this before, this would make a really nice gift. Wow! What a great gift idea! It looks so well done. Thanks for sharing. What a great project Ashley. Love the candle idea. Thanks so much. Love the candle especially with the gem in the middle. It has been awhile since I embellished a candle. Thanks for the inspiration. Like the candle idea...great gift idea! The candle is beautiful and so elegant. Thanks for the tutorial! this is a fun blog hop, seeing lots of intereting blogs that i hope to return to soon. thanks for a chance to win! Every year I PLAN to decorate candles. Thanks for the reminder to urge me to get started early. Great job on the candle! This is such an elegant looking candle - I like the rhinestones you added. I have always wanted to try this technique but never got around to it. WOW i love it!!! great idea ashley!! mom love canddles i bet she would love to come and find the house filled with decorated canddles!! Wow....I have always loved candles like yours. What a great idea! Candles are a terrific gift! Thanks for sharing. Beautiful candle Ashley! Thanks for showing us an inexpensive gift that looks fantastic. What a wonderful idea for a Christmas candle. I think I will make a few to give to the visiting nurses that come to the house. I love giving hand made gifts and was trying to think of something to make this year. Congratuations on your coming baby! What a neat way to decorate a candle! I'm going to have to try it! Thanks for the idea. Christmases will never be the same after the little one comes and you'll wonder how you ever enjoyed Christmas without him/her. Wow! A tree in every room. I love that idea! 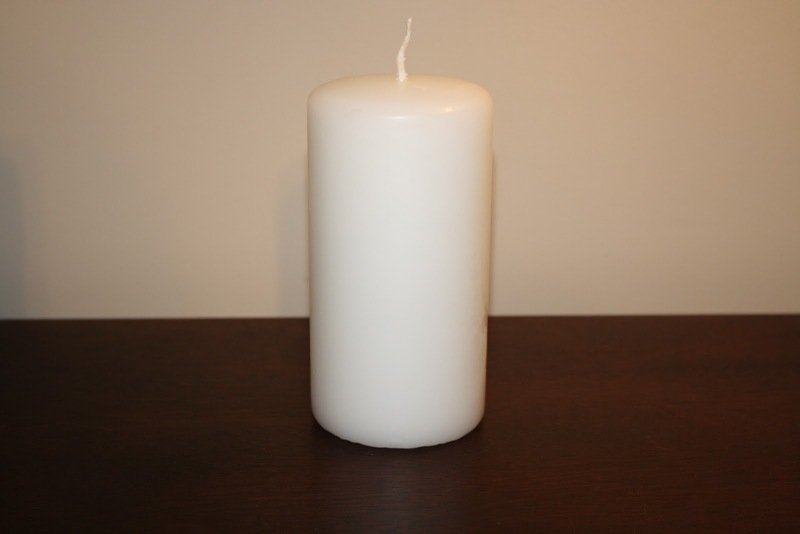 This is a very cute candle gift and the best part is that its economical. Your candle is awesome! Great work! That is really beautiful. I have never seen that done. Thanks! What a cute idea, I never tried stamping on a candle. So many ideas, so little time! Thank you. Ashley ~ What a great idea. Congrats on your upcoming delivery. This is the second decorated candle Ive seen whilst surfing the web today. Love that you use embossing powder and hopefully will be giving it a go soon. Love the candle... nice project! THANK YOU, THANK YOU, THANK YOU!!! I received my prize today and it is amazing. Thank you so very much, Ashley! Hi Ashley! You won the blog candy giveaway at my blog during the Operation Write Home blog hop. (http://www.withalime.blogspot.com) Could you please email your address so I can send out your prize? Thanks!